A hydraulic cylinder is a mechanical actuator, which transmits the longitudinal force between two mechanical components. An yoke is welded on the cylinder rod. Its U-shape allows to be positioned in between 2 articulated arms of the wheel loader. Yokes have to resist to high levels of mechanical loads without permanent and residual deformation. Therefore the geometrical accuracy of the forging part is of critical importance. 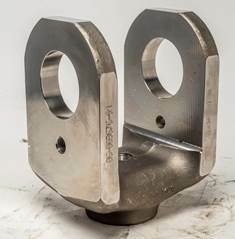 Setforge know-how guarantees the precise size of a cylinder yoke during manufacturing and the component’s excellent behavior during friction welding. Setforge is the forging division of Farinia Group and has been supplying the off-highway industry with high-quality yokes for already 20 years. Our manufacturing expertise includes both presses and hammers, with or without additional machining. The yokes are made of standard steels as well as microalloyed steels.